ArtsEmerson Presents Laurie Anderson's "Delusion"
Pioneering multimedia performance Laurie Anderson will present "Delusion," her powerfully personal meditation on life, longing, identity and memory, for six performances only at the Paramount Center as part of ArtsEmerson's new season of international theatre programming. Performance dates are September 27 - October 2. Laurie Anderson is a masterful storyteller whose groundbreaking integration of technology, violin, visuals and voice spins spellbinding tales. At the heart of "Delusion" is the belief that words and stories can create the world, as well as make it disappear. Conceived as a series of short mystery plays, "Delusion" jump-cuts between the everyday and the mythic. With altered voices and imaginary guests, Tibetan temple horns and Arabic strings, Anderson brings "Delusion" to life employing her trademark electronically enhanced violin and a group of supporting musicians. With both humor and terror, the evening conjures up elves, mysteries, ghost ships, and dead relatives to spin poetic stories. "Delusion" was originally commissioned by the Vancouver Winter Olympics (2010) and the Barbican, London. 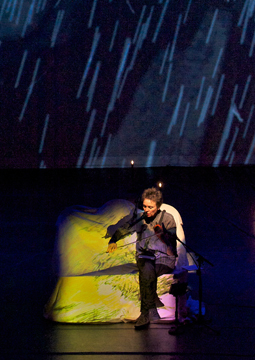 Laurie Anderson stands as one of America’s most renowned and daring creative pioneers. Her work has challenged and delighted fans around the world for more than 30 years. Her first album, "O Superman," launched her recording career in 1980, rising to number two on the British pop charts. She went on to record six more albums. Her tours have taken her around the world, where she has presented her work in everything from small arts spaces to grand concert halls. With numerous major works to her credit, she has also worked on countless collaborations with artists ranging from Jonathan Demme and Brian Eno to Bill T. Jones and Peter Gabriel. Recognized worldwide for her groundbreaking use of technology in the arts, she was appointed the first artist-in-residence of NASA in 2002. She was also part of the team that created the opening ceremony for the 2004 Olympic Games in Athens. More recently, she received the prestigious Dorothy and Lillian Gish Prize for her outstanding contribution to the arts. For tickets and information, stop by the Paramount Center box office at 559 Washington Street in Boston’s Theatre District, call 617- 824-8400 or visit artsemerson.org.